Does Romney Have a Moderate Problem? Mitt Romney is enduring a tough week. 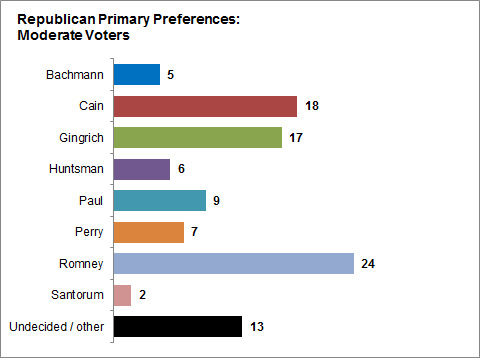 He now trails Newt Gingrich by 20 or more points in some state and national surveys. He had a testy interview with Brett Baier of Fox News, and then compounded the problem by complaining about Mr. Baier’s questioning later. A candidate whose presence in the race probably helped Mr. Romney, Herman Cain, is now in jeopardy of dropping out. Both Democrats and Mr. Romney’s opponents are putting out ads that hit Mr. Romney on what is perhaps his core vulnerability, his reputation for flip-flopping. Meanwhile, one of Mr. Romney’s greatest strengths, his strong positioning in New Hampshire, is at least a bit less certain now following the endorsement of Newt Gingrich by the Manchester Union-Leader. The central analytic question surrounding Mr. Romney’s campaign, however, is not a new one. Instead, it’s the same thing that pundits have been asking for months now. Why has Mr. Romney been unable to sustain a performance much above 20 percent in the polls despite having run a very strong campaign, racking up more and more endorsements, and being matched up against what seems to be a fairly weak set of opponents? I don’t know that there is any one right answer to this question, but I will tell you what I think is an overlooked part of the problem: Mr. Romney is not all that well-liked by moderates in the Republican party, a group with whom he should be racking up a big advantage given the conservative slant of most of his opponents. Yes, Virginia, there are still moderate Republicans out there. Not as many as there used to be, but enough that they will constitute perhaps one-third of the Republican primary electorate. I looked at all the surveys of Republican primary voters that the firm Public Policy Polling has released since the start of October — a total of 17 polls covering 14 states as well as a couple of nationwide surveys. Public Policy Polling breaks out its results based on whether the voters identify as moderate, somewhat conservative, or very conservative. Although the sample sizes for each group are small in any one survey, they become quite meaningful when averaged together. 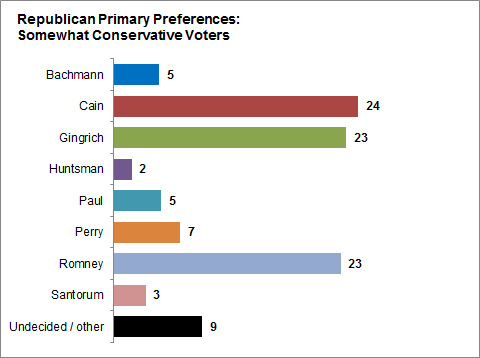 Perhaps unsurprisingly, Mr. Romney does not do all that well among the most conservative voters. Over the past two months, his support among voters who describe themselves as very conservative has averaged 13 percent. That isn’t nothing, but he’s almost always trailed among this demographic — first to Mr. Cain and more recently to Mr. Gingrich. Mr. Romney’s support has been considerably more solid among Republicans who describe themselves as somewhat conservative, averaging 23 percent over the past two months. 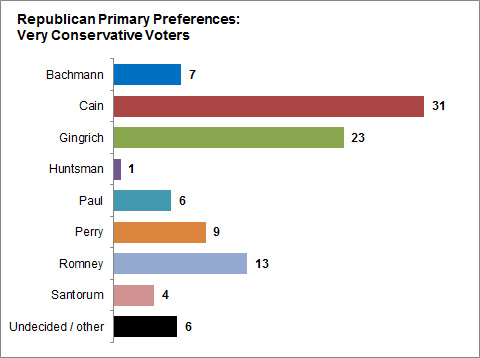 He has usually trailed either Mr. Cain or Mr. Gingrich among this group, but he is doing reasonably well with these voters overall. You might expect that a candidate who performs tenuously among very conservative voters but pretty well among somewhat conservative voters would remain on a linear trajectory and do quite well indeed among moderates. Mr. Romney, however, has averaged only 24 percent support among moderate Republicans. While this total leads the Republican field, it is not doing as much as it might to help offset Mr. Romney’s disadvantages with the most conservative Republicans. Moreover, the middling total comes despite a lack of competition for the moderate vote, although both Ron Paul and Jon M. Huntsman Jr. are doing considerably better with moderates than they are over all. 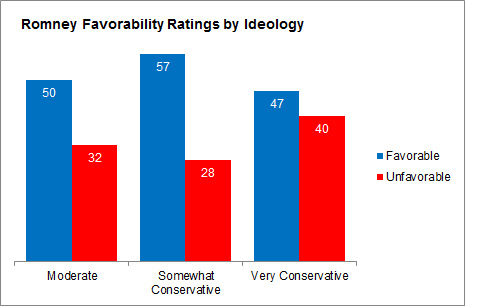 Mr. Romney’s favorability ratings among moderate voters, meanwhile, are not all that strong: 50 percent of moderate Republicans say they take a favorable view of Mr. Romney, quite a bit worse than his total among somewhat conservative voters although better than his figure among very conservative ones. What this seems to suggest is that Mr. Romney may have calibrated his ideological pitch a bit too finely. While not having made much headway with the most conservative Republicans, moderates are also somewhat leery of him. Were Mr. Romney polling at 40 or 50 percent among moderates instead, numbers that you might intuitively expect from a candidate who is often critiqued from his right, his base of support against surging candidates like Mr. Gingrich would be more robust. But so far he has posted somewhat underwhelming numbers with this group. Mr. Romney’s failure to shore up the moderate vote also creates the potential that he might have to fight a two-front war. The key player here would almost undoubtedly be Mr. Huntsman, whose national numbers remain weak but who is now polling at about 10 percent in New Hampshire. If Mr. Huntsman continues to improve on that total, it could cut into Mr. Romney’s margin in the state and perhaps allow a candidate like Mr. Gingrich to beat him there with around 30 percent of the vote. I do not mean to suggest that Mr. Romney should abandon his strategy and begin running to his left — the Republican Party is still the conservative party and a candidate has to pick the lesser of evils. Nevertheless, there are probably some trade-offs when Mr. Romney seeks to do things like attack his opponents on immigration policy from the right; such strategies may run the risk of annoying moderate voters while failing to persuade the most conservative ones.